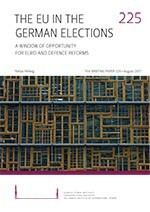 Ahead of the federal elections, international challenges have energized the German debate on how to reform and strengthen the EU. While Germany’s traditionally pro-European bias remains intact, details on how to move forward are controversial. German politics has proved to be relatively immune to anti-EU populism, but Germans raise expectations that the EU needs to deliver results. Berlin has adopted a more flexible approach that seeks a balance between Germany’s principle of preserving EU unity and allowing for reform coalitions among less than 27 member states. German parties agree on the need for further Eurozone reforms, but have different visions. Conservatives and liberals stress national responsibility and oppose steps towards a ‘transfer union’, while Social Democrats and Greens appear ready to extend solidarity in a more integrated Eurozone. In a compromise with France, Germany is more likely to increase financial solidarity, if based on meaningful investment projects and tied to oversight and structural reform. Uncertainty over the transatlantic relationship has prompted a renewed German commitment to a more self-reliant EU on defence matters. While Berlin is working closely with Paris on developing European defence capabilities, Germany wants new defence initiatives to be open to willing EU partners and in sync with NATO.